To protect sensitive and personal information, you may encrypt the file with data encryption software. 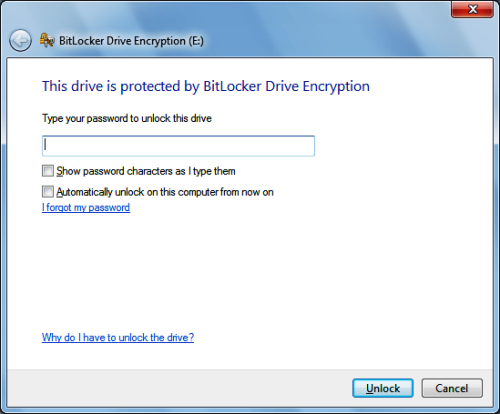 BitLocker is a disk encryption software comes with the Ultimate and Enterprise editions of Windows Vista / 7, the Pro and Enterprise editions of Windows 8 / 8.1. By default it uses the AES encryption algorithm in cipher block chaining (CBC) mode with a 256-bit key. 256-bit AES encryption is a strong encryption standard adopted by the US government. Warning: It is important to note that once information is encrypted by any encryption software, it can only be opened with the CORRECT password. Losing the password means losing the information for good. Protecting sensitive data on a USB thumb drive using "BitLocker To Go"
BitLocker is a disk-based encryption tool, you are recommended to create a Virtual Hard Disk as a container for data protection. 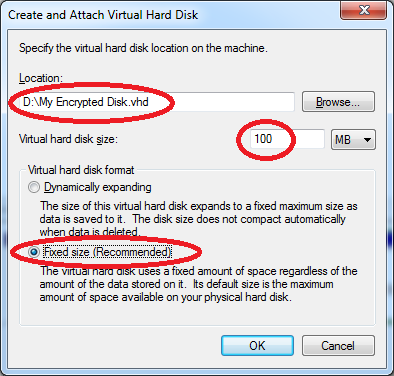 Create a new Virtual Hard Disk (VHD) file . 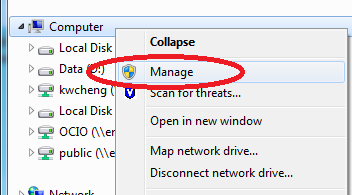 Open the Computer Management window then right click the Computer or PC icon and select Manage. 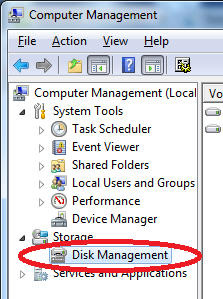 Select the Disk Management item. 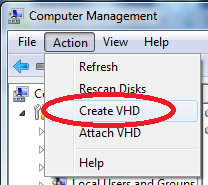 Select Action -> Create VHD from the menu bar. Initialize the new virtual drive. 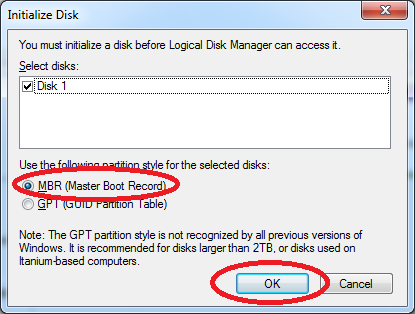 Click the new disk icon using the right mouse button and select Initialize Disk. 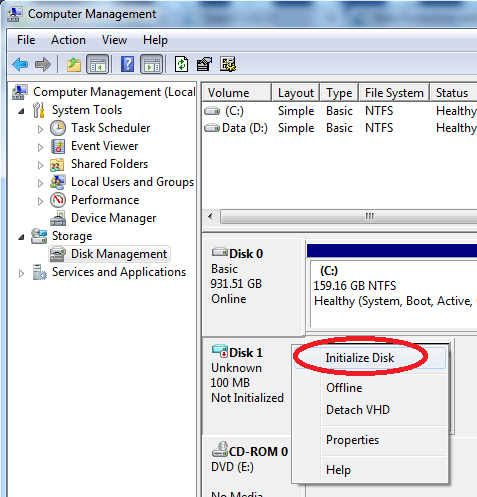 Then create a partition on the virtual drive. 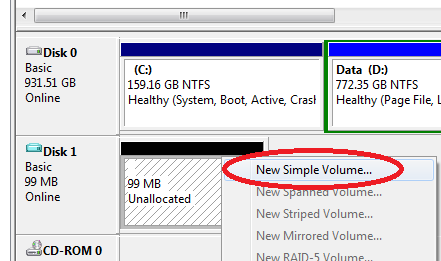 Right click the Unallocated space and select "New Simple Volume"
Press Next for the welcome screen. 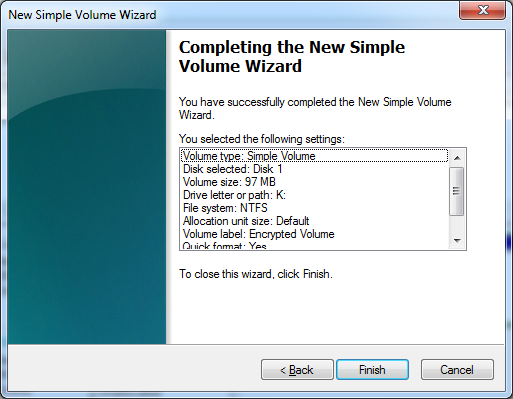 Press Next for the Volume Size (It will use all available size by default). 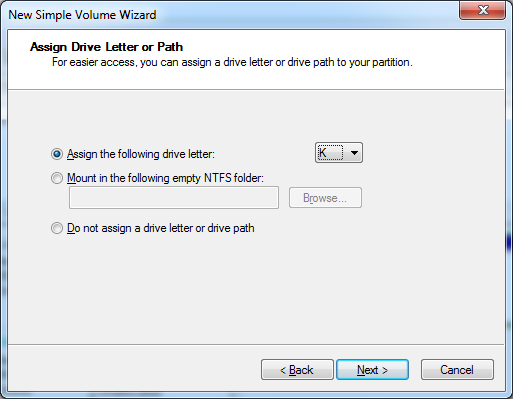 Assign a drive letter for your virtual disk and press Next. 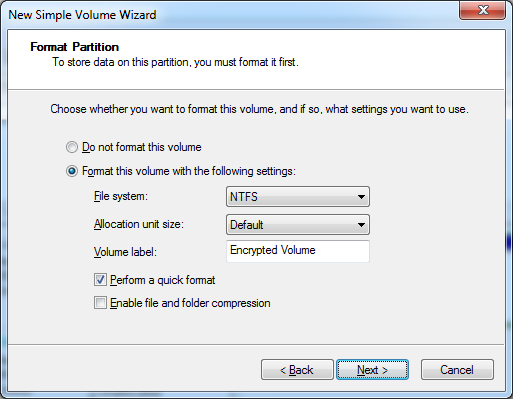 Use the default settings for the partition format and press Next. Press Finish to start format the virtual disk. Tick the option "Use a password to unlock the drive" and enter your password. Then press "Next". Choose a way to store the recovery key. Then press "Next". 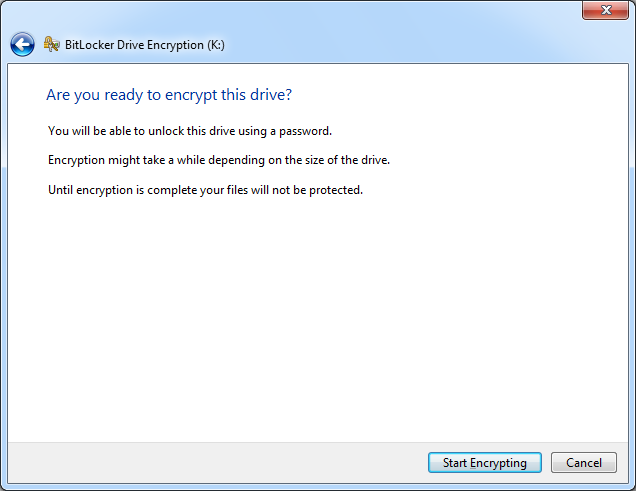 Then you can store data to the new virtual drive encrypted by BitLocker. 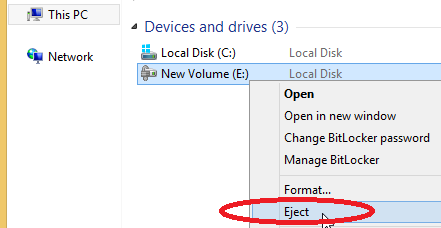 To dismount the drive, right click on the drive and choose "Eject". 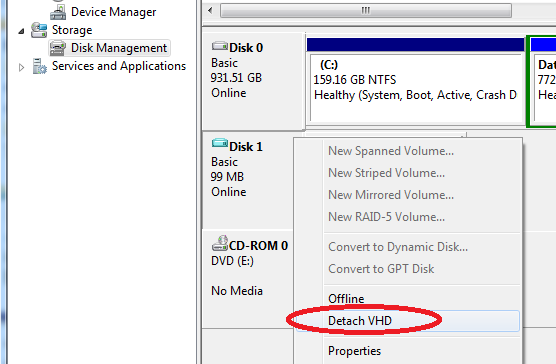 To dismount the drive, choose "Detach VHD" in "Computer Management ". To mount the drive again, right click your VHD file and choose "Mount" from the menu bar. 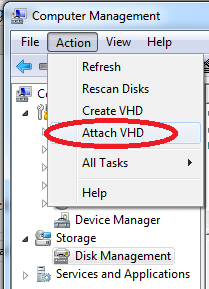 To mount the drive again, choose "Action" -> "Attach VHD" from the menu bar. 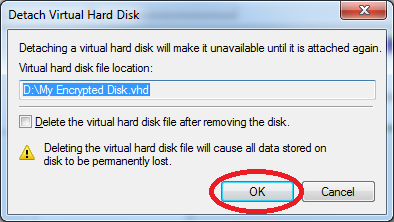 Select the VHD file location and press "OK". 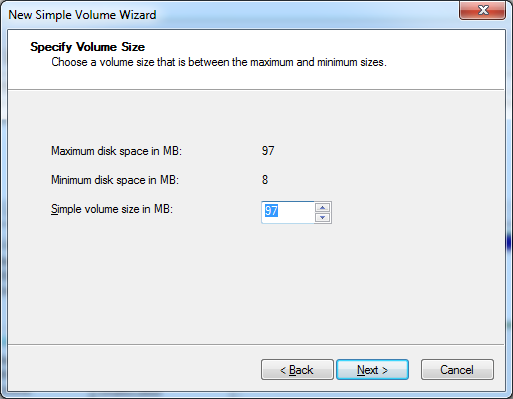 Note: Do NOT delete the VHD volume (i.e. the file "My Encrypted Disk" in this example). Otherwise, all the files stored in the container will also be deleted. 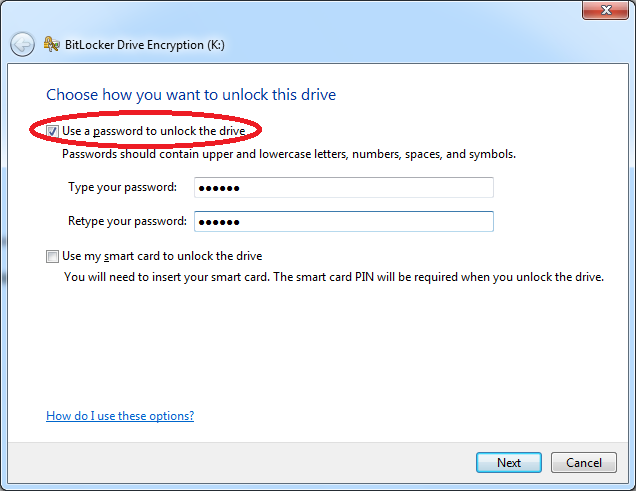 Basically, "BitLocker To Go" allows you to encrypt a USB drive and restrict access with a password. 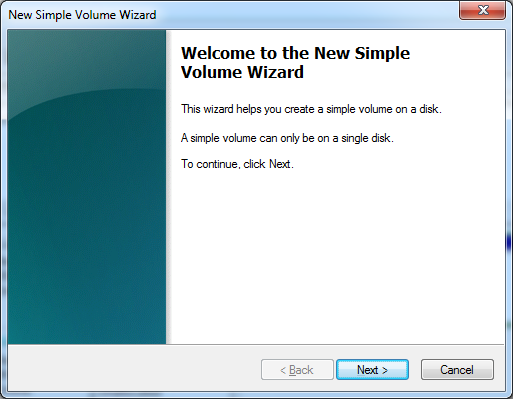 When you connect the USB drive to a Windows 7 computer, you are prompted for the password, and upon entering it you can read and write to the drive as you normally would. During the encryption process, Windows 7/8 installs a special reader on the USB drive. 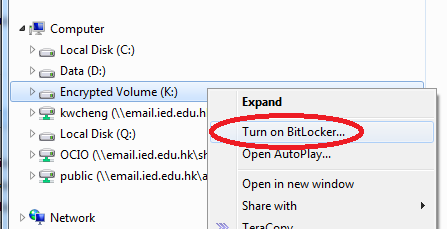 When you connect the USB drive to a computer running XP or Vista, the BitLocker To Go Reader takes control, prompts for the password, and then basically makes the USB drive a read-only device. Once the initialization process is complete, BitLocker To Go will prompt you to set up a password that you will use to unlock the drive. 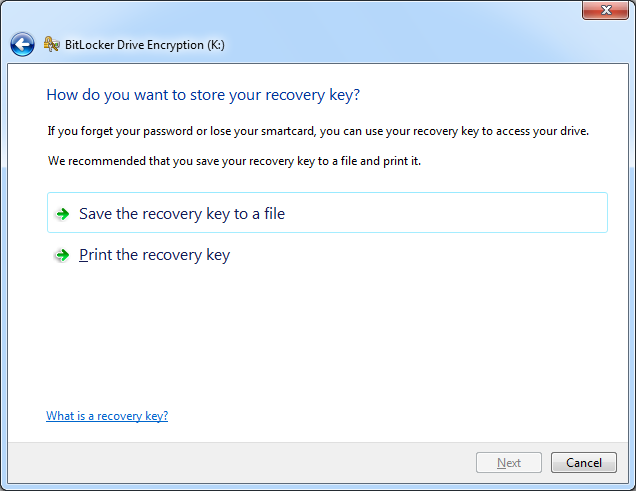 To ensure that you don't lock yourself out of your drive, BitLocker To Go will create a recovery key. 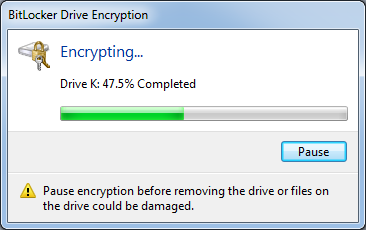 When the encryption is complete, you'll notice that the drive icon shows a lock on the drive.